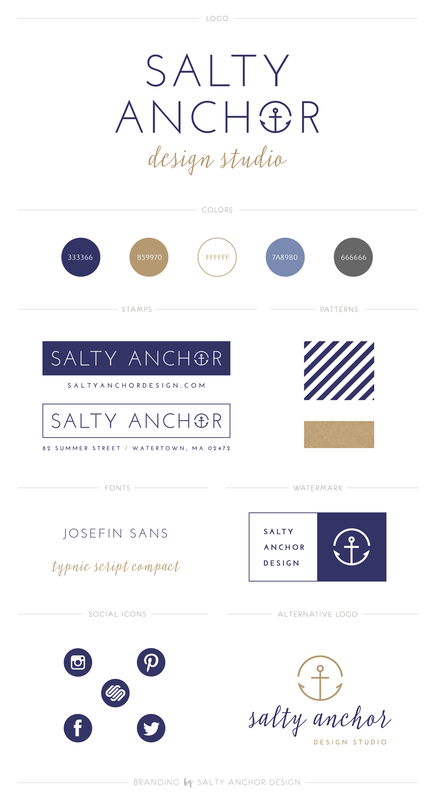 Welcome to the new Salty Anchor Design Studio! I am so excited to finally launch my new brand, which has been in the works for quite some time. Formerly known as RP Design, I had then quickly decided to run with a name that easily came to fruition and had some personal name recognition as I started my business. My formal initials were RP, and I was a designer...and that's how RP Design was born. As my business evolved into a branding studio, I thought long and hard about applying a new name to encompass my work. I wanted something that had more of a company feel with a touch of creativity. How did I come up with Salty Anchor? To put it very simply, I love salt (on my bagels, apples and tomatoes especially) and I love anchors (the image, the style and the overall nautical idea of them). The more I repeated these two words in my head (and in many a dream over the past several months), I became attached to both the depiction and the meaning of the two together. First of all, an anchor provides stability and security. When that anchor is dropped and locking your vessel in place, the longer it's holding ground, the saltier it will become in that deep ocean water. And with that, I also identify with salt in the adjective sense meaning sharp, down-to-earth and even witty (if I dare to say so myself). When I'm working with my clients, I always aim for a straightforward approach, full disclosure and services that are clearly defined. I want to be a resource that they rely on and trust in. My job is to not only create brands and websites that best depict and represent a business, but to become that reliable go-to designer and brand manager down the road as these businesses grow. So from now on, consider me your Salty Anchor. Take a look at the design I mulled over and over...and over. I wanted a look that was not only crisp, but also had a slight playful option as you'll notice with the script style mixed in. My own brand serves as an example of the guidelines I offer my clients for their businesses. With these various assets, I have been able to create an entire suite of marketing materials. With some on-brand variety to choose from, my look won't become too repetitive across all of the different advertising mediums I use. If you have any questions about your own brand, I'd love to speak to you and see what we can iron out together. I offer client consultations and love learning about other business's goals for their style. If you are a fellow creative and are interested in a collaborative effort send me a message!